Product #1323 | SKU CONVOPENGSYNC | 0.0 (no ratings yet) Thanks for your rating! The Blackmagic Design CONVOGSYNC is a rack card sync generator operating within the OpenGear standard. 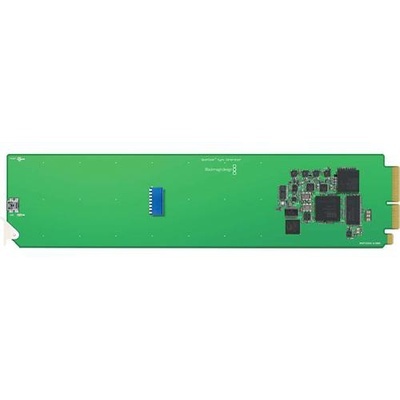 This card includes rear module connectivity and operates within a convertor chassis with other OpenGear devices. OpenGear is an open standard for rack mount convertors and processing for television broadcasters. OpenGear uses a 2 rack unit rack frame that holds up to 10 plug in cards, or a double density frame can be used to hold up to 20 cards. Many manufacturers develop OpenGear cards and frames that can be mixed and matched. OpenGear cards are hot swappable and can be controlled by java based DashBoard network control and monitoring software on Windows, Mac OS X and Linux. This generator includes 10 crystal stabilised video reference outputs for referencing all the video equipment in the user's studio with either high definition tri-sync or standard definition black burst.